Simplex Time & Attendance software solutions are available in a range of packages suitable for small to large enterprises. Simplex simple employee tracking software can save your business time removing data entry and time calculation from your weekly, fortnightly or monthly payroll process. These packages can be purchased with a number of Hardware & Software combinations. 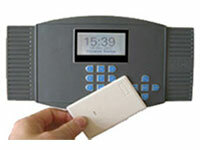 Proximity Badge, Finger Scan and Hand Scan Terminals. Tell us about your needs and we'll provide a system quote for you.